In the foyer, like a shrine, looms a Hills Hoist, suspended upside down. Pegged on its sagging, rusty lines are photo negatives from the Filipino-Australian Berry family album alongside other bicultural paraphernalia — a serpentine jade-tinted Catholic rosary, a takeaway box from the Philippines’ own multinational fast food company Jolibee, an errant strip of a plastic doily and a single child-sized gumboot. When the doors to the performance space open for LabAnino’s This Here. Land, a collaboration between Filipino-Australian and Philippines-based artists, Andrew Cruz’s welcome reminds us to keep our belongings close before crossing into yet another Manila migratory transplant. 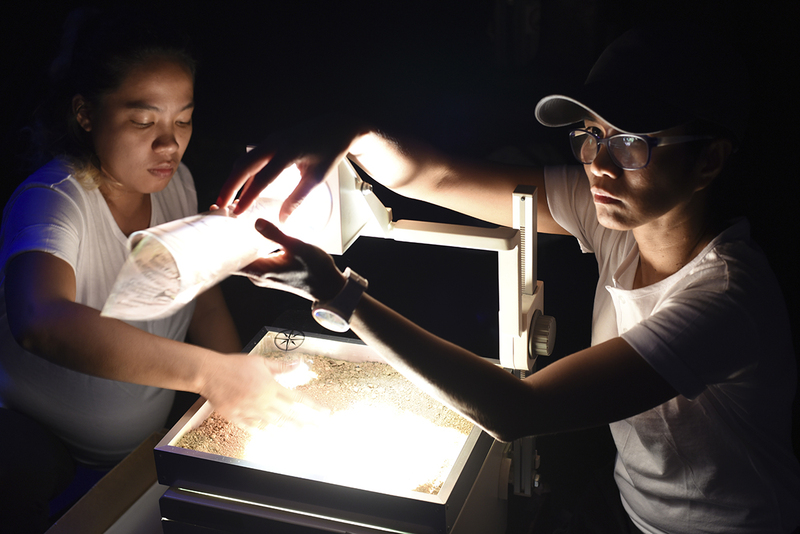 Unlike the interactive cardboard city of LabAnino’s 2011 production Within and Without at Blacktown Arts Centre, this Manila aspires to Instagrammable cultural cache, dotted with white gallery plinths, red carpets and golden bollards. Our first stop is at large double doors thrown open to reveal more Catholic imagery — a tableau comprising audience members from the previous performance crowded around as Kenneth Moraleda and Valerie Berry recreate an iconic image of one of Rodrigo Duterte’s drug-dealer widows cradling her bullet-ridden partner on the street. It is an image that Cruz instructs us to illuminate with our phone torch apps before ushering us into the next area. There, in a graphic description of poet Jose Rizal’s execution, he energetically provides the bloody historical context of Filipino independence before splitting us into groups to experience stories that take place either in the heart of Manila or the hearth of the Berry household in Western Sydney. I end up at a street hawker stall where I’m served an instant coffee while listening to a working class man (Cruz) ranting in Tagalog (with Hazel Gutierrez interpreting) his begrudging working class approval of the killings, wishing to dissociate himself from what he perceives as the more criminal elements of his milieu. Later, Gutierrez performs what could be termed an ultrasound-monologue, broadcasting her unborn child’s heartbeat from her pregnant belly. We also read its worries in a simultaneously projected text, lamenting being born to artist parents in tumultuous times. Next, Berry whisks us away from manic Manila to peaceful corners of South Australia, reminiscing about many a family excursion aided by projections of old photos and Anino Shadowplay’s exquisite sand-based animation. When the Berrys move to Sydney, Moraleda, repeating the granular motif by cutting up a long coke-line made of Epsom salts, recalls bohemian life in 1990s inner city Redfern, where stereotypes of the suburb’s downtrodden residents abound, linking Australian and Filipino attitudes to drugs. 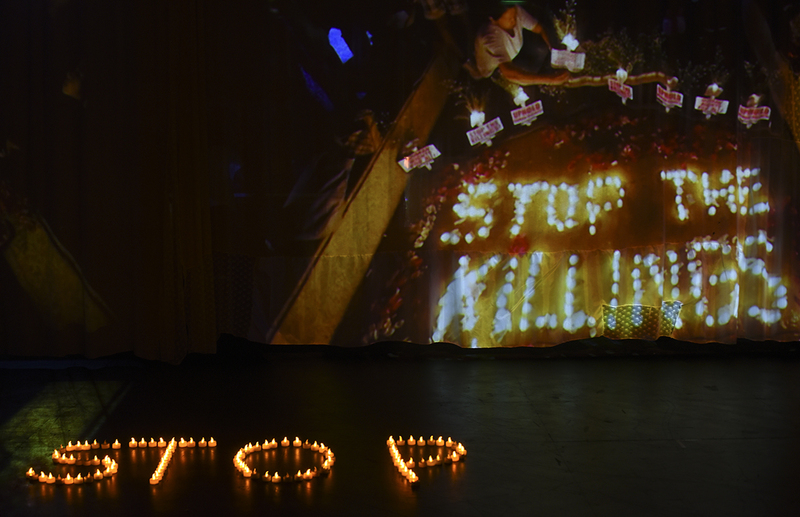 We wrap up our journey with a karaoke-soaked candlelit memorial for the fallen in Duterte’s war and are ushered into the foyer to form the tableau that greets the next audience. This Here. Land presents an engaging collage of stories with a sense of continuity that evokes, if on a smaller scale and at some 35 minutes, Alexander Sokurov’s breathtaking Russian Ark (2002), its 96-minute continuous camera shot taking viewers through Russia’s tumultuous history reflected in St Petersburg’s Hermitage Museum collection. LabAnino is a dynamic ensemble. If at the time of viewing, This Here. 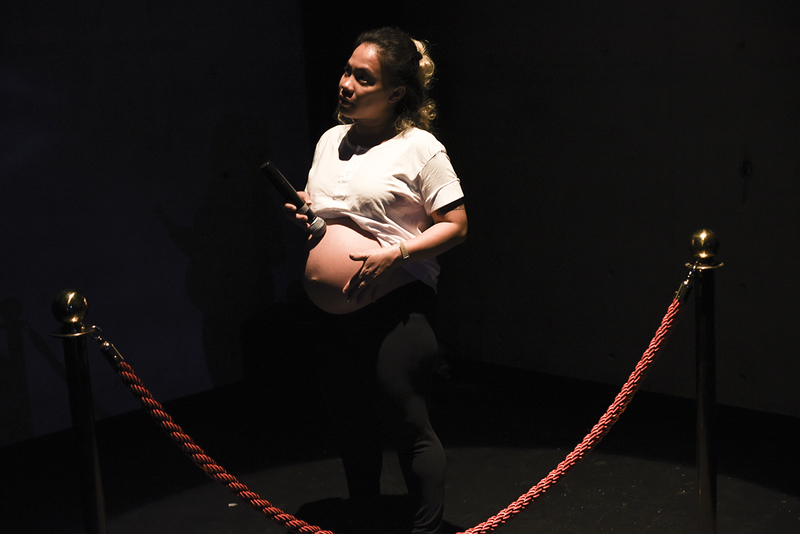 Land narrowly subordinates the Berrys’ Australian suburban narrative, the sense of urgency expressed in highlighting contemporary Filipino social upheaval is palpable.